Are you fed up with seeing your kids with their eyes permanently on a smartphone? Modern life is full of instant gratification, electronic interaction, noise, in fact a 24/7 digital virtual reality. It runs like a film in the heads of our youth. What happened to good old fashioned virtues such as concentration, focus, isolation, solitude even? And more importantly, how can you get your kids to engage with something other than electronic media? Many parents are worried about the effects that gadgets are having on their children. So what can you do to try and entice your kids away from their phones and tablets and into another world, the real world? Well you might consider target archery. Kids will think it’s cool to shoot. Bows are featured in their video games after all! We’ve put together this list of 23 reasons. Take a look there’s bound to be something you hadn’t considered…. Here’s a full rundown of all those lovely benefits! Growing up with the occupation, routine and discipline of a sporting challenge central to their lives has real benefits for kids. It keeps them away from bad company and the lure of smoking, drinking and drugs. Target archery offers an alternative focus to studies and provides a constructive and comforting structure which can be reassuring. The interaction with others creates friendships, team reliance, expectations and dedication and fosters commitment and accountability. As a result many kids grow in confidence and this can really have a big hit on their academic studies too. Archery is completely weatherproof so no huddling in bad weather on muddy touchlines for the relieved parent! A year round sport, archery can be conducted in a gym or sports hall or outside in the fresh air in a field. Discipline comes in many different forms in the archery setting. There is the need to learn to follow rules for the purposes of safety and competition to the inner self-discipline that is required to shoot well. All children will benefit from this to a lesser or greater extent. Constant exposure to phones and Ipads and interaction on social media leads children to unfocused and random patterns of mental behaviour. Those children who have had noted discipline issues within the classroom, will often see an improvement in their behaviour at school after time spent in the archery environment. Kids have to concentrate on one thing, to focus solely on their performance. They learn to manage unnecessary and unwanted emotions and distractions in order to shoot well. Archery requires slow and measured steps focusing on precision and preparation in order to ensure that the arrow hits the centre of the target. Kids quickly learn that measured concentration and deliberation reaps good rewards and this can have an almost magical effect on a difficult child. Success in many sports only comes about after a series of failures. Archery is all about step by step methods, learning how to handle the bow, load the arrow, draw the arrow and release it. Learning how to make improvements and seeing poor performance as a challenge rather than a problem creates a great precedent. Kids learn that if they look at each step in turn, it is possible to make incremental improvements. This can change the whole picture and thereby the final result. Archery is a tremendous metaphor for life and teaches problem solving skills and resilience which are transferable to so many other situations. Some children don’t handle failure well because they have never succeeded at anything in their lives. Other children have not encountered failure because they have been uber successful at everything. Archery exposes weakness and lack of technique but crucially offers a constructive pathway to improvement and skill. Children who have been underachieving at school finally find something that they can learn and succeed at. Talented children have to take a step back and humble themselves to be poor or average at something whilst they hone their technique through training. Both ends of the spectrum can compete on equal terms. Both benefit in completely different ways from the failures they will encounter on the road to learning how to shoot well. Archery teaches kids resilience and the importance to keep trying. Archery is a unique sport in which each person takes responsibility for their individual performance but it also offers the opportunity for teamwork. Working with other archers teaches young people the rules of engagement, teamwork and dealing with both success and failure. Within the team context, kids have to take responsibility and buy into other people’s skill set. They learn to assimilate performances that are weak and affect the team adversely or situations where the other archers outperform them. Target archery offers the perfect environment for collaborative teamwork and engagement with peers both younger and older. There is the chance to look up to older participants and the opportunity to support and mentor younger shooters. Archery may not shout out at you as a physical sport but there are a surprising amount of health benefits. There is a lot of cumulative walking in an archery session, a few miles in total in a competition. Walking back and forth to retrieve arrows really racks up the steps. An archer can walk as far as five miles in a one day tournament so a great excuse to wear a Fitbit. And don’t overlook the fact that it is a sport done standing up and over a period several hours or more so it is very beneficial for posture. Drawing a bow requires controlled strength and many top professional archers spend time in the gym honing their upper body strength. Successful archery requires strength but the key to good target shooting is control, the tiniest movement can make a world of difference. So stability and balance are top of the list for good shooting not just strength alone. And hand eye co-ordination is essential for archery. Endurance and stamina are also key factors on top of all of these skills. Archery is a long and repetitive sport particularly on a tournament day. Archery improves general co-ordination and specific hand/eye co-ordination which can be useful for other sports and skills such as driving a car or playing a musical instrument. Competitive archers name the ability to deal with pressure as one of the top three factors in successful shooting. Archery is a fusion of strength, control and accuracy and herein lies the pressure. Managing a stressful situation and not crumbling or allowing it to affect performance, is one of the key life skills you can teach any child. How many times going forward in adult life will they need to call on that reserve? And of course coping successfully with pressure really develops confidence and inner self-respect. Patience is a virtue and in archery, kids have to learn to be patient with both themselves and others. They have to be patient, learning to wait for the right moment to release the bow. They have to be patient whilst they wait for others to shoot. They have to be patient when their own performance is below par and try to shoot better and patient with their peers when their performances are disappointing. Archery requires total focus, the ability to block out external distractions and concentrate on one thing, how often do kids do that these days other than stare at their phone screen? 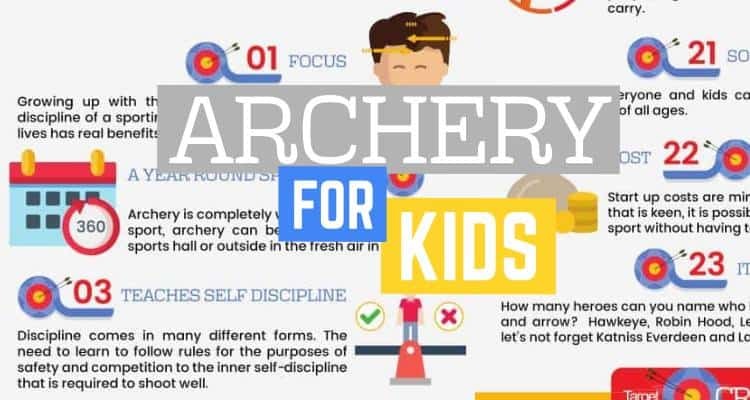 Archery teaches kids how to concentrate, how to maintain and increase their attention span. This is a great skill to harness and will pay dividends at school. Self-control is a key essential in successful shooting. Archery requires not only total control of the body but also complete control of the mind. Kids have to learn the ability to control their thought processes, their emotions and their response, tough when the situation is challenging and pressurised but a great life skill. Coping successfully with difficult situations will always build confidence but archery offers something else too. The process of learning to shoot and shoot competitively teaches self-knowledge and self-awareness. Understanding your weaknesses and learning about your strengths develops a self-knowledge which can prove powerful for young people as they grow up. Self-awareness provides a response mechanism to many different situations. Kids learn how they react under pressure, in difficult situations and as a team player. They develop strategies for coping and improving performance which will stand them in excellent stead later on in life. Learning how to shoot successfully is a layering process. Skill, technique and experience layer one upon another to achieve target prowess. Even for the most competitive child, there is always another goal, another challenge. So this is one sport that your child will not lose interest in due to lack of stimulation. And archery is not so difficult that even a newbie cannot pick up a bow and have a go. This is important as young shooters need encouragement; they need to feel that improvement will bring reward. Archery is accessible early but offers boundless horizons for those young shooters who want to move on and develop further. Mental acuity means a sharpness of the mind. The key components in assessing or developing mental acuity are memory, focus, concentration and understanding. Target archery offers the young mind the opportunity to develop really good mental acuity. Having a good understanding of the particular challenges and difficulties on the day is an important factor. Memory allows the brain to draw on past experiences and instruction. Good mental acuity really improves school work and can in fact be applied to any life challenge. With these pathways in place in the brain, reaction time is increased. Did you know that archery is actually one of the safest school sports your kids can be involved in? Archery does have risks but these can be really well managed by a good archery club. Teaching children about safety makes them take responsibility for their own behaviour and also the safety of those around them. This fosters a community spirit and encourages children to think outside of themselves. Mindfulness is well recognised these days as a therapeutic technique. In our increasing 24/7 world and virtual world, it is something that is becoming much higher profile. This is because there is not enough of it about. Mindfulness is a form of meditation but if you have ever tried to meditate and switch off your brain, you will know how difficult it is. How much harder is that for a child? By providing an actual focus to work on, it is easier to achieve mindfulness and all the benefits that it has to offer. Mindfulness is time out from problems and difficulties, from external interaction, from any and every electronic device. Your kids may never agree to sit in silence in a room on their own and meditate. However they may think that shooting is cool and achieve the same mental benefits through focusing on a target, literally and metaphorically. With practice, any kid can get good at archery. It requires work but it is possible to become an accomplished shooter and having an accomplishment is a big positive in a child’s life. It demonstrates perseverance, commitment and tenacity and engenders confidence. After this list of varied and wonderful benefits, don’t overlook the obvious, fresh air. As sport declines in profile and importance in schools, the benefits of being active outside has diminished in the lives of young people. It seems simple and old fashioned but there are so many health benefits to simply being outside. For many children, they need a reason to go outdoors and archery provides just that incentive. Going for walks is boring for most kids but engaging in a challenging and interesting sport is not. Children who spend time outside usually have a better concentration span, greater creativity and a healthier body. The old adage of a healthy body leads to a healthy mind is certainly true. Archery can be enjoyed by all children and young people regardless of any impairment they may carry. Enjoying a sport which is wholly inclusive is just as important for able bodied kids as it is for kids with impairments, special needs or disabilities. Working with other kids who have difficulties or limitations develops personal skills and a broader awareness of society. Inclusivity encourages engagement, empathy and compassion which in turn leads to greater self-awareness and self-knowledge. Equally kids who feel that they are disadvantaged either mentally or physically will find a welcoming place in target archery. This is a sport which embraces a large range of shooters with all kinds of limitations. Archery is for everyone and kids can learn to shoot with people of all ages. Interaction with other generations is really beneficial for children and young people and brings great opportunities for engagement. Older people can offer tips and techniques and it’s great for kids who may not have access to an extended family at home. It gives kids the message that archery is for life and is timeless. Archery can be an economical sport to get going in and this can be pretty important to families on low incomes. But no parent wants to splash out a fortune on expensive sports kit and equipment only to find that the initial interest soon fades away. With archery you won’t have to do this. Start up costs are minimal and even with a child that is keen, it is possible to go a long way into the sport without having to spend a fortune. There are very few sports like this. Checkout our articles covering a range of youth compound and beginner recurve bows. Kids tend to like archery because they can easily see improvements. They can mentally or actually plot “getting better” and see that result from the application of proper practice. One of the top three reasons why kids like the National Archery in the Schools Program(NASP®) is the friends they make being a part of it. How many heroes can you name who hold a bow and arrow? Hawkeye, Cupid, Robin Hood, Legolas and let’s not forget Katniss Everdeen, Lara Croft and Guinevere. There are also a lot of archery heroes in the virtual world! Archery is cool whatever age you are and there are plenty of modern super heroes your kids can identify with – male and female – who shoot. Being cool is important to kids so tap into cool and offer them the chance to become like one of their super heroes. Above all, archery should be fun and doing something cool is fun. So if you thought archery wasn’t for your kids, then think again. Archery offers one of the widest ranges of skills and exposure of any sport and it is accessible, easy to get involved in and won’t cost you a fortune in kit when you start. And just remember for kids, when it comes to archery, they will need to learn to be slow in a hurry!